A reader let me know today that the factory where Hubig's Pies are produced in New Orleans was destroyed in a five-alarm fire last night. This is sad news indeed, for as I wrote in a previous NOLA blog post, these small pies are delicious and "manufactured" without much machinery, i.e., real people made these desserts, and have been making them since 1922. The families that own the company hope to rebuild. 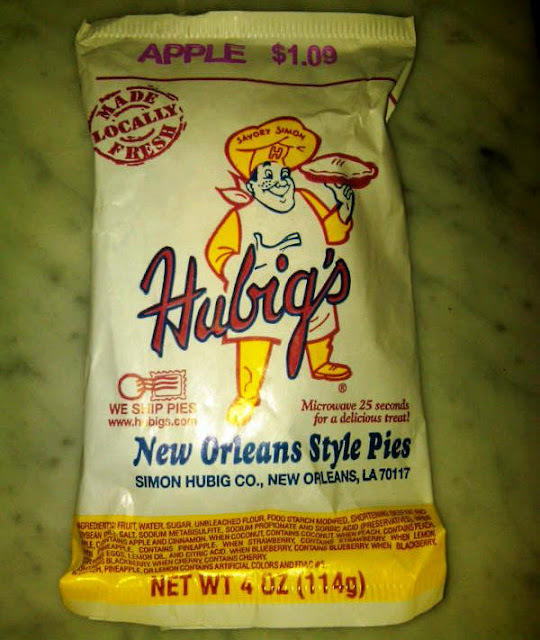 But today, I'll bet that every Hubig pie, available in grocery stores and drug stores, has been sold, since it will be a while until they sweeten New Orleans again. Are you interested in a simple and delicious yellow cake recipe that can be used to make Boston Cream Pie, coffee cake, fruit cobbler and more? Then pull up your chair. How do I know this? 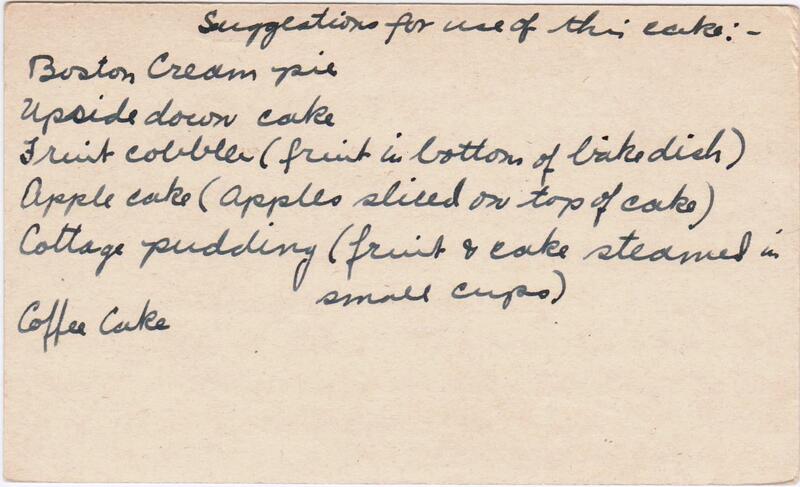 For one, the recipe is called Cake. Just Cake. 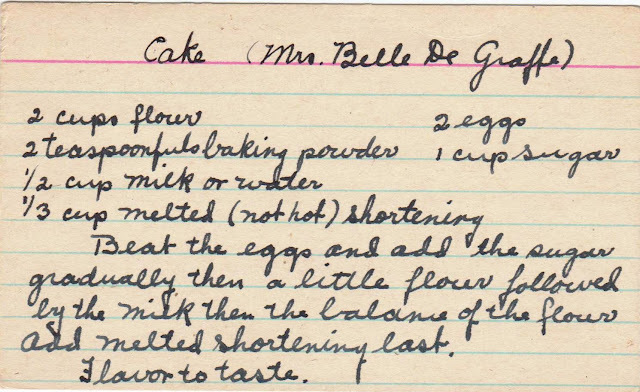 And check out the back of the recipe card, where Mrs. Belle De Graffe, the recipe's author, provides "Suggestions for the use of this cake." 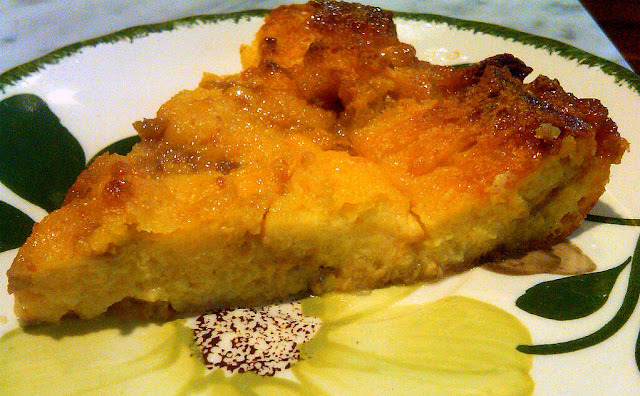 Because I had fresh sour cherries on hand, the last of this year's harvest, I chose to make an upside down cake, but I imagine this versatile recipe would be equally delicious in any of the suggested applications. 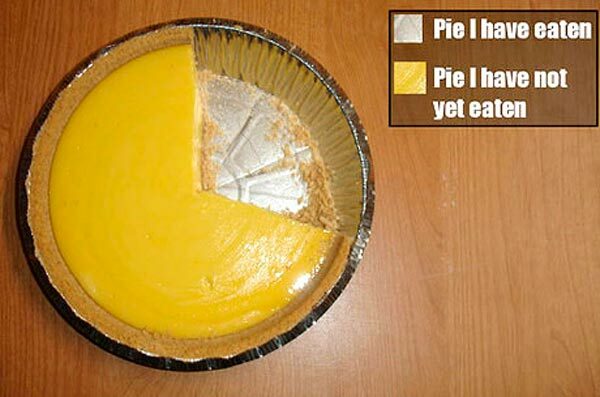 And, it's nearly foolproof. You can see below how I forgot to add the baking powder until the very end (it should have been incorporated much earlier, with the flour), and it still worked beautifully. 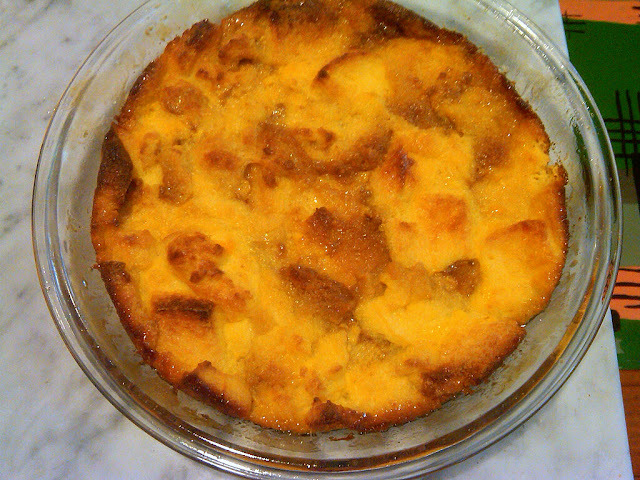 Next, I mixed the batter and poured it over the fruit (and butter/sugar) mixture, spreading it with a spatula to cover. I used an eight-inch pan, but a nine- or ten-inch one would have better accommodated the amount of batter. This cake should have been left in the oven a bit longer. But we were late visiting our friends and I had no choice but to pull it from the oven. But despite what I thought was an underdone cake, friends Karin and Jim raved about it, especially Karin. Well, it certainly was moist. 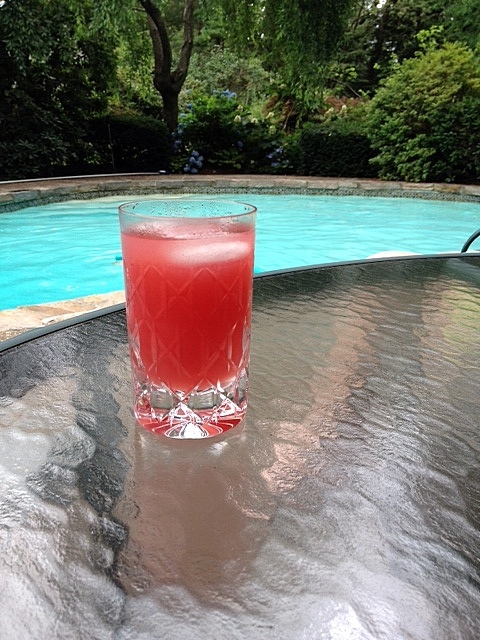 It didn't hurt that we enjoyed the cake with some fresh watermelon margaritas by their pool, courtesy of expert mixologist Jim. In March, I wrote a post about the arrest of a desperate mother who stole a jar of yeast in order to bake bread to feed her hungry children. I was moved by the story, which I had read in Denis Hamill's column in the New York Daily News, as were thousands of others and the ending was happy: readers donated money to the impoverished mother, and authorities connected her to the social services she needed. But is she a con artist? That's what an anonymous commenter on my blog claims. And even more interesting, s/he notes that the mother, Margaret Deming, is the daughter of notorious serial killer Arthur Shawcross, aka "The Genessee River Killer" who murdered 11 women near Rochester, New York, from 1988 to 1990. He died in prison. Does biology/genetics determine destiny, in this case criminal behavior? Is Margaret Deming doomed by her family history? 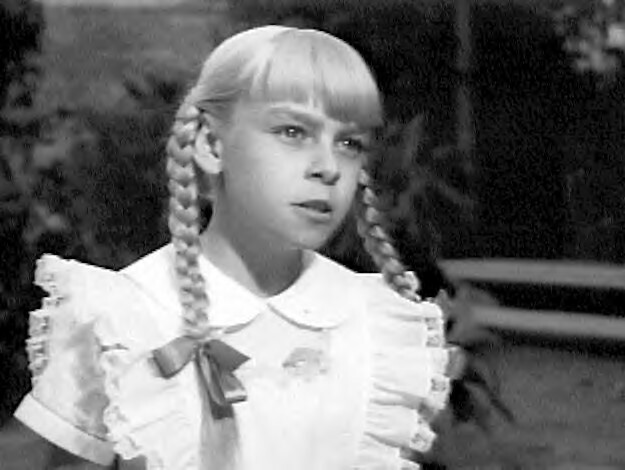 I don't know the answer, but that question is addressed in one of my favorite 1950s film, The Bad Seed, in which a child named Rhoda (pictured above and played by Patty McCormick) is truly a bad seed (she kills people) and is later revealed to be adopted, and her biological father a serial killer. 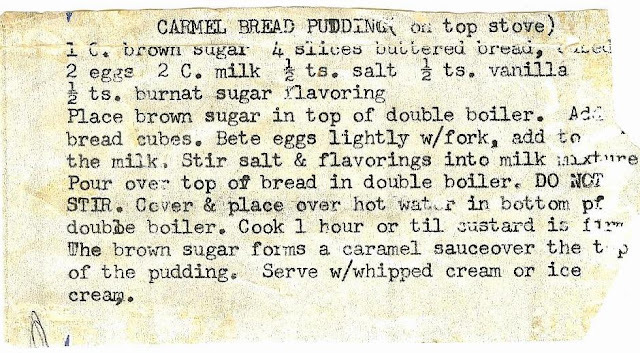 Doesn't Caramel Bread Pudding sound divine? It conjures up images of a warm rich custard with the complex flavor of burnt sugar caramel sauce. Plus, because it's cooked on the stove (and not in the oven), I thought it would be perfect. Except it wasn't. Not quite a disaster, but certainly not the spectacular domed dessert I imagined. I started with a store-bought sliced white bread. 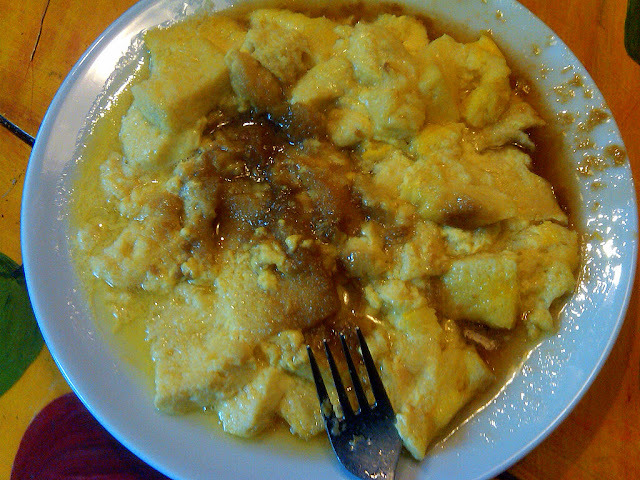 The custard is made with eggs and milk. 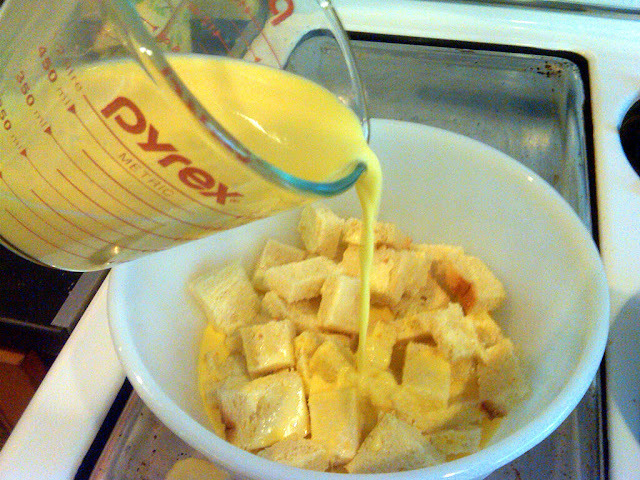 Brown sugar is placed at the bottom of the bowl, followed by the bread cubes and then the custard is poured over it. The recipe calls for this to be made in a double boiler, only I don't have one. So I improvised with this vintage Fire King bowl, thinking that when the pudding was cooked, I would invert it and have a gorgeous domed dessert enrobed with a caramel sauce. But this is what I got instead. 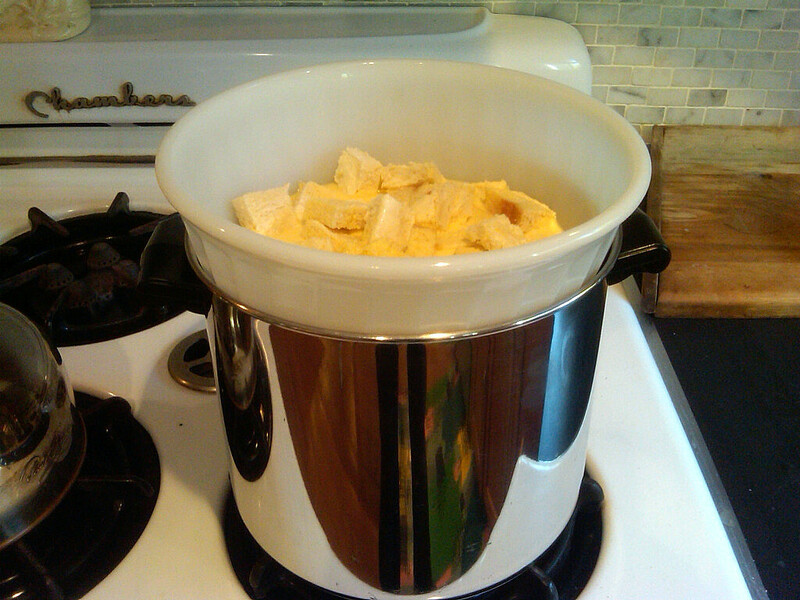 Perhaps I didn't cook it long enough or needed a real double-boiler. Reluctant to toss all this potentially good stuff, I scooped it into a pie plate and baked it until the top was caramelized. The result is below. Not exactly what I had in mind, and no one will want to have what I'm having, but pretty tasty after all. Say there's a typical, i.e., "normal" recipe. Then there's an unusual recipe, one I've never seen before with directions that need their own instruction manual. Which one would I choose? 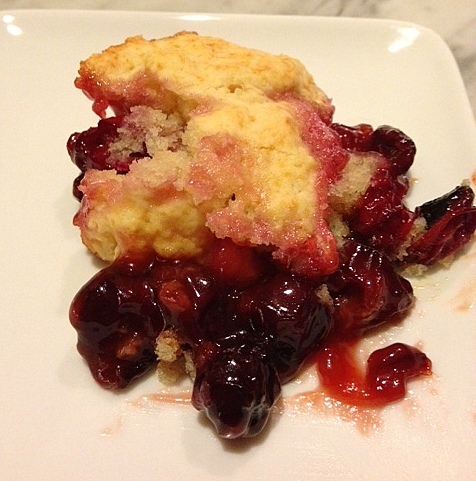 Hello, cherry dumplings. 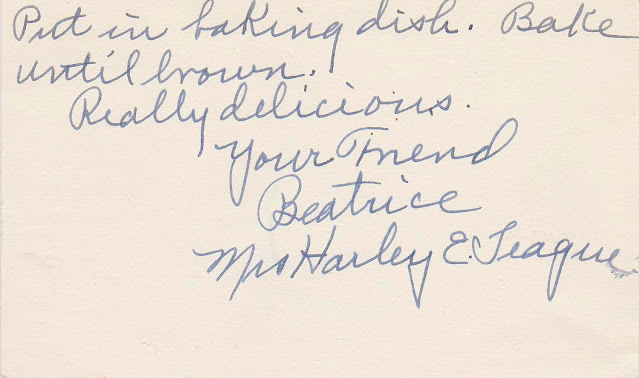 It didn't hurt that the recipe's author, Mrs. Harley (Beatrice) E. Teague wrote "Really delicious" on the recipe card. These cherry dumplings are made like chicken and dumplings (the dough is dropped into a boiling pot to cook), not like Chinese-style dumplings in which cherries are encased in a smooth dough wrapper. It all started out well, boiling some pitted sour cherries with some sugar. (You can read here about pitting the cherries.) While that was happening, I made the dumpling batter. 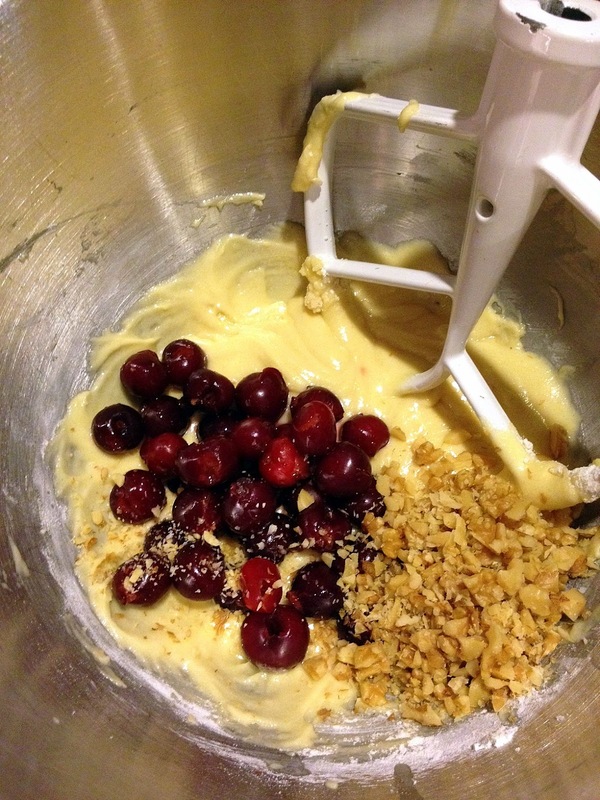 I dropped the batter by spoonfuls into the boiling cherry mixture and said a prayer. A few of the dumplings took a cherry bath, i.e., submerged. I wasn't sure if this was a good thing or not. I let them cook for a while until the batter seemed cooked through. What I should have done: Googled cherry dumplings before I began. As you might imagine, there were not a lot of recipes, but every one said to cover the pot. Which makes sense, because the dumplings would steam beautifully. Well, maybe next year, though these were pretty good. Below is the recipe card for all you adventurous souls out there. For everyone else, I've provided an instruction manual, i.e., I've translated and interpreted the recipe. 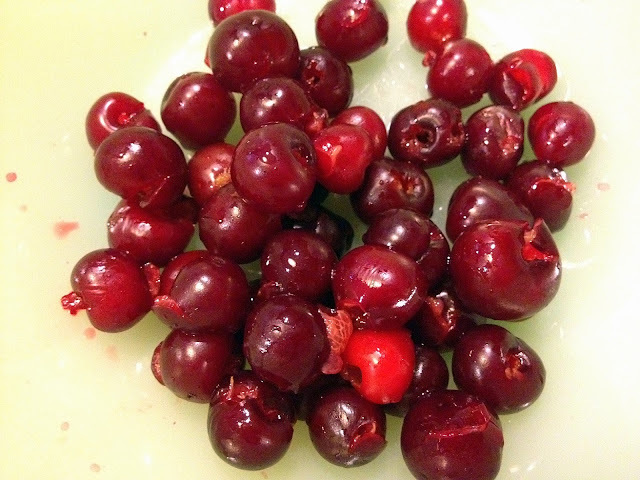 Boil until sugar dissolves and cherries begin to soften. Drop batter by spoonfuls into boiling cherry mixture. Lower the heat, cover the pan and cook until the dumplings are done. 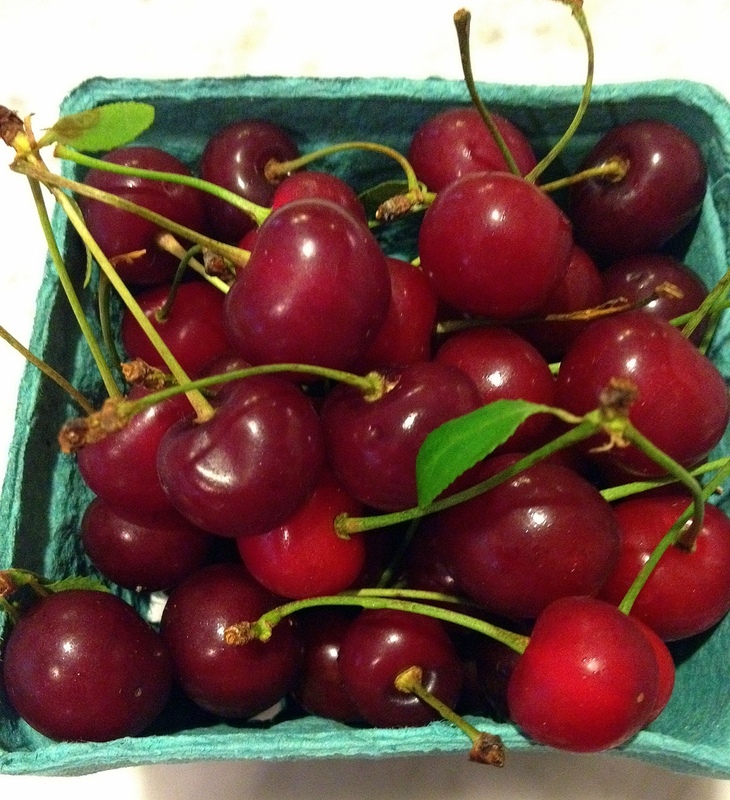 I simply could not resist the rare sour cherries at the farmer's market on Saturday and, having purchased two boxes, I began a search for vintage recipes (a process which involves carpeting my dining table with hundreds of recipe cards). These tart cherries (in season for just five minutes each year) shine in baked goods; eating them out of hand, well, not so much. Luckily, I found two intriguing recipes and so, just in time for July 4th, I present the first: Cherrie Delight. 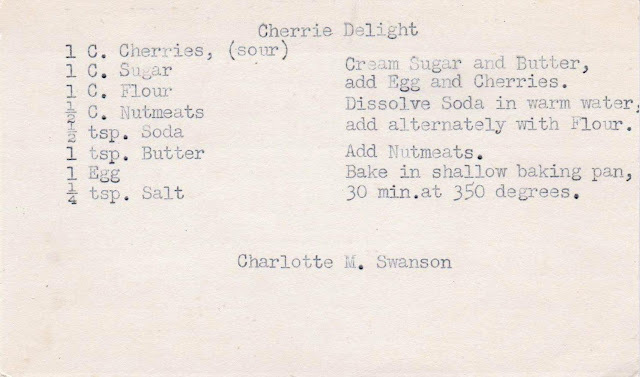 Yes, I realize that the author, one Charlotte M. Swanson, misspelled cherry, but she typed this card way before the advent of personal computers and its wonderful sidekick, spell check. This is an absolutely delicious dessert, though not sure if it's a cookie or a cake. 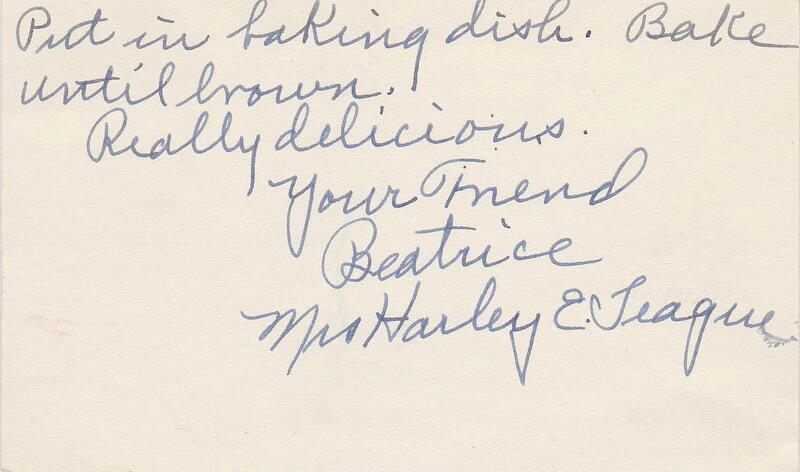 But it is, as the recipe promises, a delight. The real work in making these is pitting the cherries, a messy task made much easier with a high quality cherry pitter. Though I typically eschew kitchen tools used only for a single esoteric purpose, I make an exception for this device. 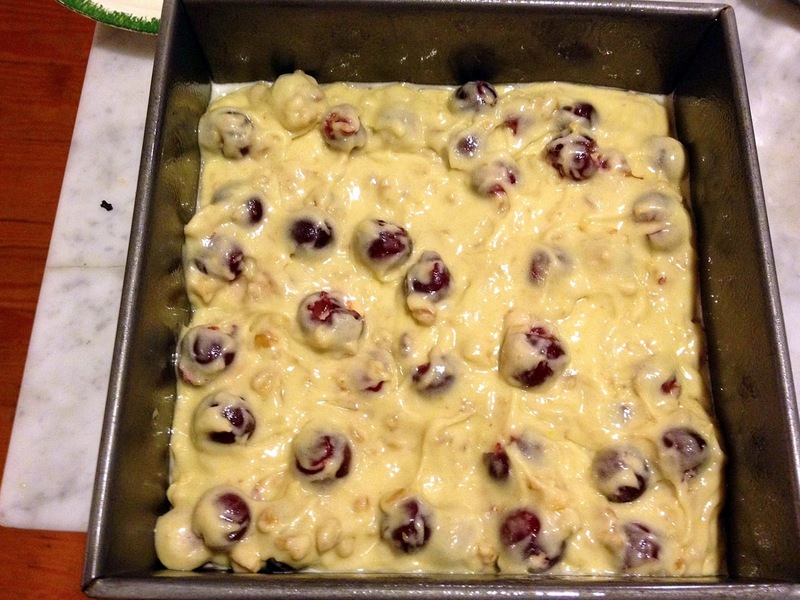 After the batter is made, add in the good stuff -- the cherries and nuts -- with an old-fashioned wood spoon. Pour into an 8 x 8 inch pan, which you've greased and floured. I neglected to flour the pan and struggled to release the cake. Bake until the top is a lovely golden color and a toothpick inserted in the center comes out clean. Here's the recipe below. While I normally follow these recipes exactly, I did make some changes on this one. 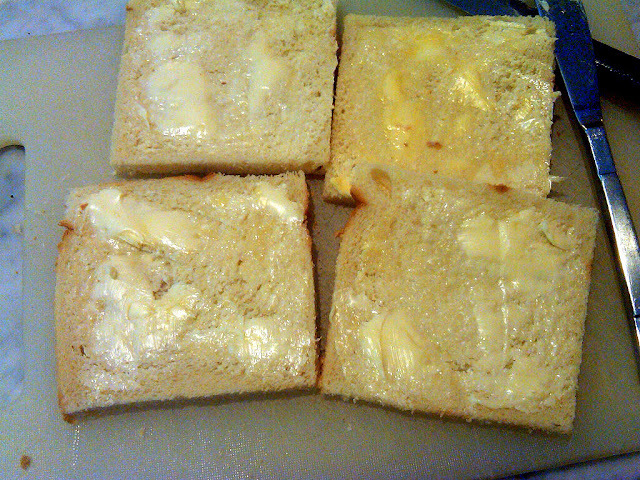 I increased the butter to four tablespoons, as one teaspoon (a tiny amount) seemed like a typo. 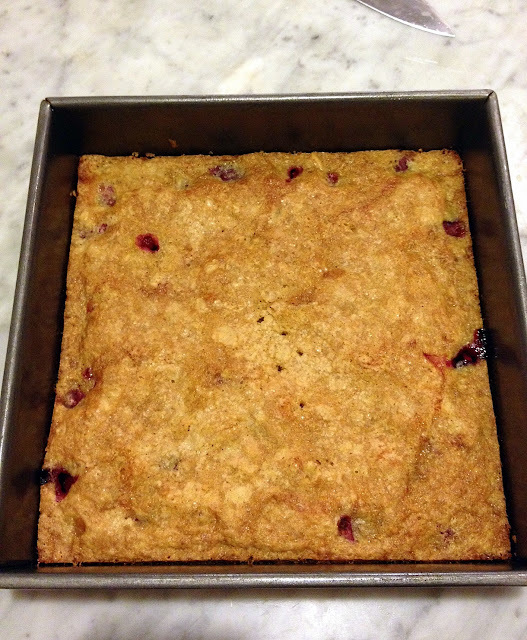 I did not add the cherries until the end -- adding them before the flour would crush them, I feared. Dissolving the baking soda in warm water was de rigueur before modern baking soda was perfected, but I still followed the instructions here, using about 1/3 cup of water. Add the salt with the flour. 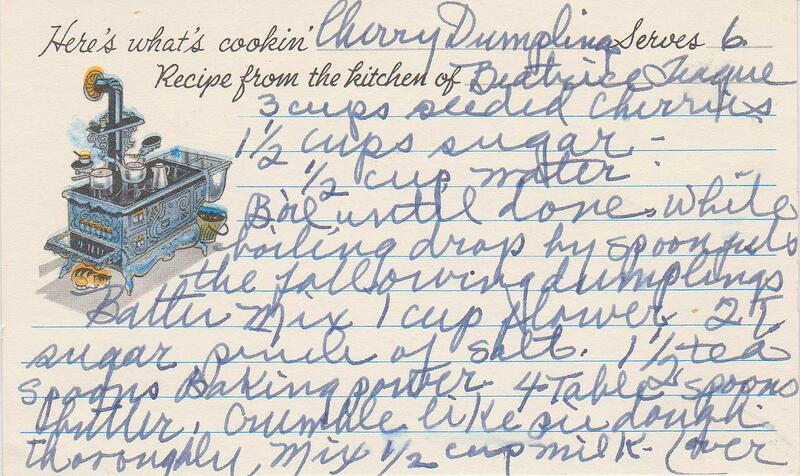 Since I have some pitted cherries left over, I hope to make a really unusual recipe tonight, Cherry Dumplings, if (and that's a big IF), I can crack the code on the very unclear instructions, and the DH will forgive me for lighting the oven when it's 90 degrees. Stay tuned.